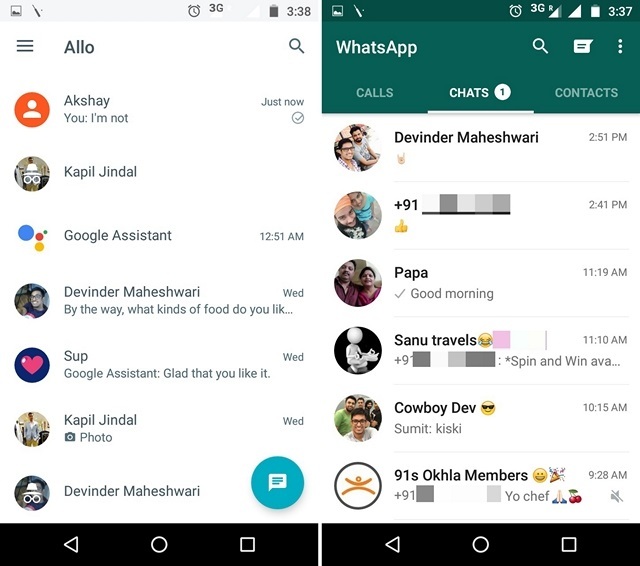 Google Allo has just arrived, after being announced at the Google I/O conference earlier this year and people are already proclaiming it to be the WhatsApp killer. While we agree that Allo’s Smart Reply feature and Google Assistant integration are some really intuitive additions, it still has a long way to go before it can even think of becoming a viable competition to the Facebook owned WhatsApp. If you’ve used Allo, you must have enjoyed it and you must have wondered how it fares against WhatsApp, right? Well, let’s find out! Note: We are comparing Google Allo and WhatsApp from an Android user perspective but most of the points should be valid for iPhone users as well. Like WhatsApp, Google Allo includes the usual features you would expect in a messaging app like the ability to share media & location, custom notifications, read receipts, voice messages, GIF support, group chats etc. However, let’s talk about the features that make Google Allo stand out against the highly popular WhatsApp. 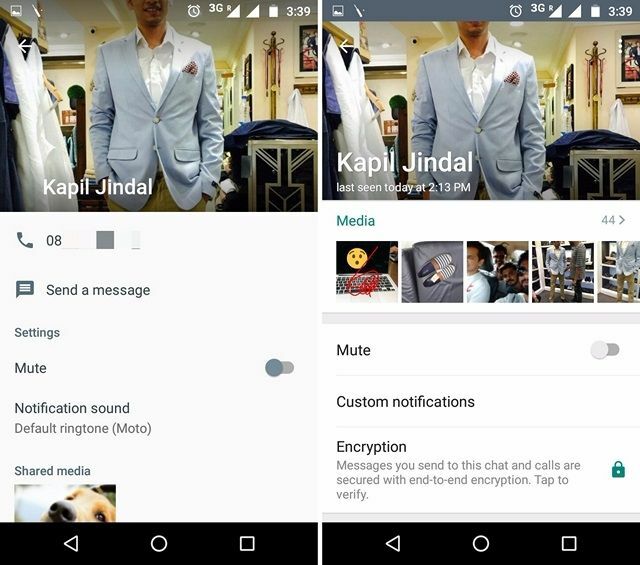 Let’s begin with a pretty basic feature like stickers, which is something a lot of people have been wanting for WhatsApp. 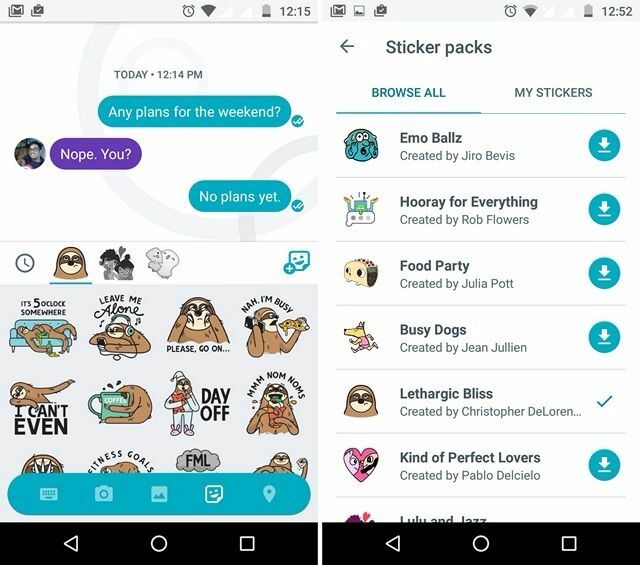 Allo packs in stickers along with a sticker store, where you can download more. The store does not pack a ton of stickers, as of now, but that should change soon, as Allo starts getting some traction. 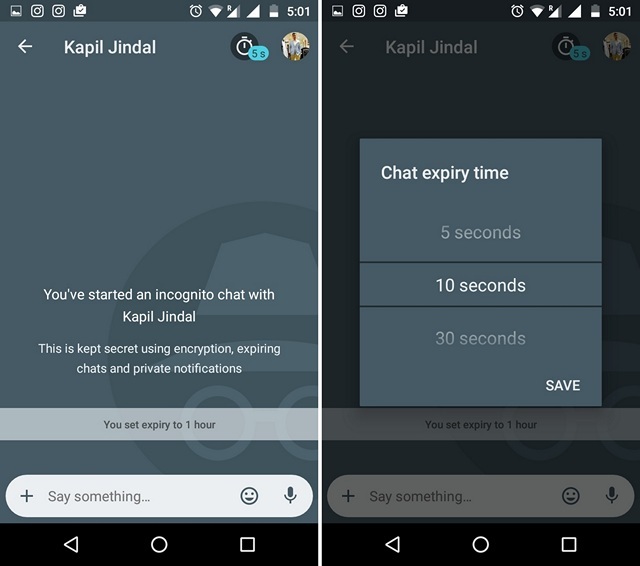 Google Allo also includes a cool incognito chat mode, similar to Telegram’s secret chats feature, which features a self-destruct timer, discreet notifications and the messages send in the chat are end-to-end encrypted. Self-destructing messages is another feature WhatsApp lacks, so Allo wins some brownie points here. Now, this is where Google Allo excels. There are a plethora of messaging apps available today and none of them pose a threat to WhatsApp because they don’t have a killer feature. Well, Allo’s Smart Reply is something which makes the messaging app a lot more addictive. Smart Replies are AI-based reply suggestions to a text or a photo and it’s not a gimmick, as we have tried the feature and it certainly works amazingly well. For instance, when you get a message like “How are you?”, Allo brings you reply suggestions like “Good and u?”, “I’m ok, You?”, “Good, u?”. It even brings you reply suggestions when a picture is send. 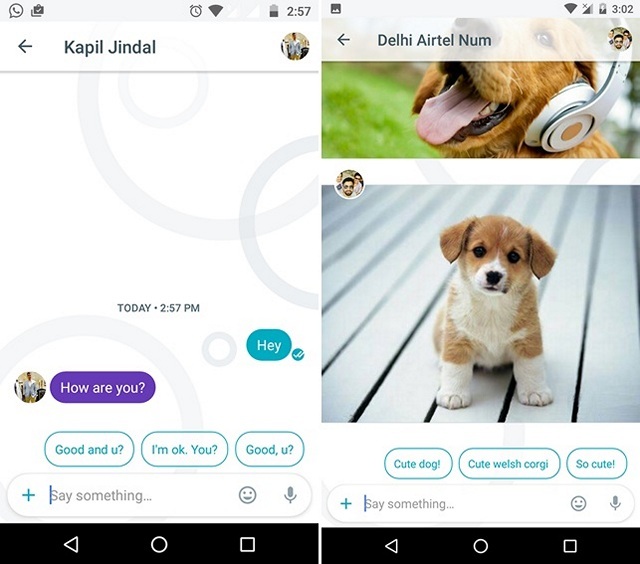 For instance, you get receive a picture of a dog, Allo will suggest you replies like “Cute dog!”, “So cute!”. Also, these smart replies are available right in the notification shade, so you don’t even need to open the app. While Allo’s Smart Reply feature isn’t able to handle complicated messages just yet, Google says it will get a lot better with time, as it learns from your way of conversing. Overall, Smart Reply is certainly handy when you need to respond to messages on the go, without taking up a lot of time. Once you’ve used it, chances are, you will wish WhatsApp had this feature too. Google Assistant makes Allo a much more functional messaging app and this is something you will dearly miss on WhatsApp. Google Assistant is everything we imagined a Google virtual assistant to be and more. 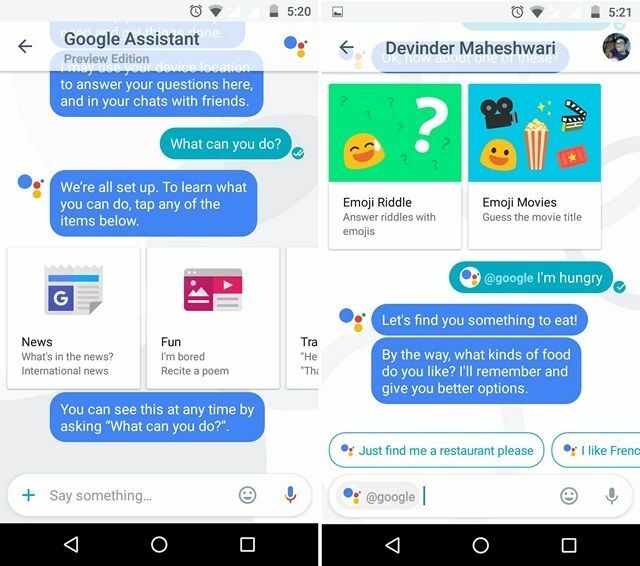 The Assistant is integrated right into Allo and you can use it in between chats via @google or use its very own chat thread. You can ask “What can you do” to get an overview of all its functionalities. You can use it to get various results like weather info, flight info, news, nearby places, navigate, play games, translate languages and more. You can even use it to set an alarm or a reminder. Plus, everything works right inside the app, so you don’t have to leave a conversation to check flights, weather, news or anything else for that matter. Also, it’s not Google Now, and it has a personality, just like Siri or Cortana, so if you’re bored, you can ask it to sing a song, tell a joke or just talk to it. While stickers and incognito chats might not entice a user to use Allo, Smart Reply and Google Assistant are some really compelling features. Well, to sum things up, WhatsApp should be scared! WhatsApp might be a feature-rich messaging app but it certainly lacks the smarts of Google Allo. If you’ve become accustomed to making calls in WhatsApp, you will certainly miss it in Allo. 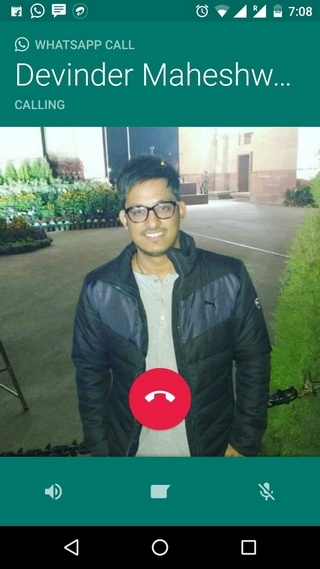 WhatsApp Calls is a very useful feature, as it lets you make calls over WiFi or mobile data and it works well even if you have a decent internet connection. It also includes a data saving mode, so you don’t have to worry about losing a lot of your mobile data bandwidth. While Google does offer video calling with Duo, it’s a separate app altogether, which doesn’t make up for a great user experience. 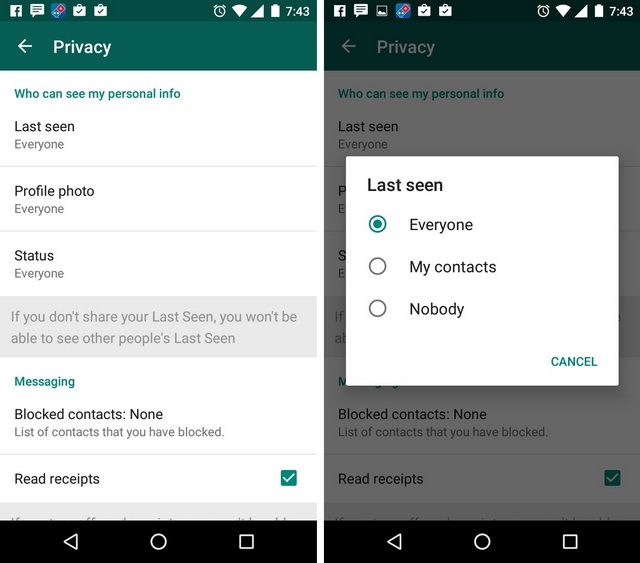 Google Allo lacks the “last seen” feature from WhatsApp and that can be a good thing or bad, depending on what you want. However, you have to agree that last seen is a good way to know if a person is active or not. Also, Allo does not show you when someone is online and while it does include read receipts, there is no way to turn it off, unlike WhatsApp. Another feature Allo lacks is Status updates, which isn’t necessarily a deal breaker but comes in handy if you want your contacts to know what’s going on with you off late. 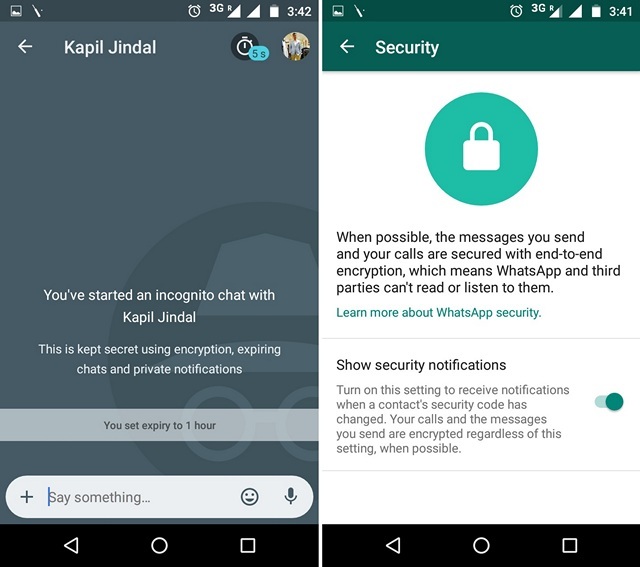 Also, WhatsApp brings more privacy related features like the ability to hide last seen, profile picture or status. 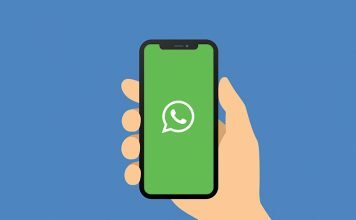 Along with media sharing, WhatsApp also lets you share PDF files, documents, spreadsheets and presentations, which comes in handy if you want to quickly send a file to a contact. On the other hand, Allo only lets you share media and location. 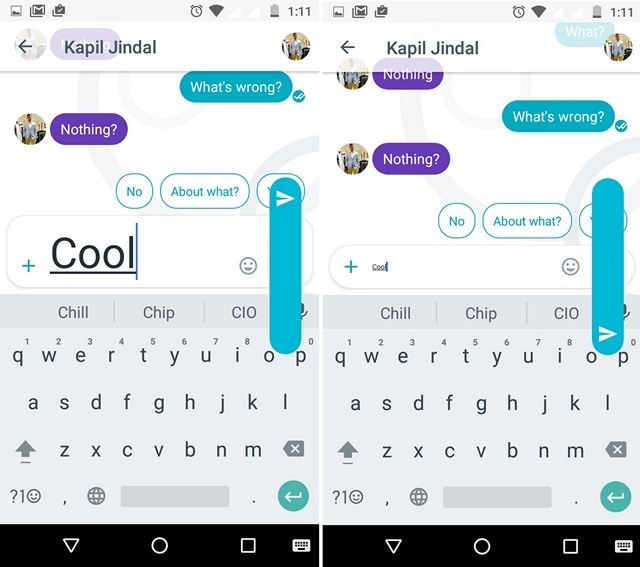 Also, as we mentioned above, Allo lacks the formatting features available of WhatsApp like bold, italics and strike-through. Unlike WhatsApp, which lets you backup your chats on Google Drive (Android) and iCloud (iPhone), Allo lacks any sort of backup feature, which is certainly surprising, considering it’s Google. When you uninstall and reinstall the app on your device, you only get the names of the group chats and none of your chats are restored. 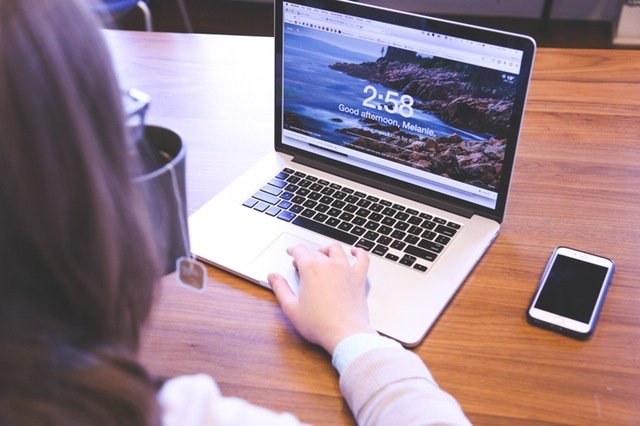 While Google should bring backup support sooner or later, the lack of a backup feature might surely be a deal breaker for some people. Now, this might be another deal breaker for some. Google Allo is currently limited to Android smartphones and the iPhone, which might annoy people who want to access their messages on a computer too. 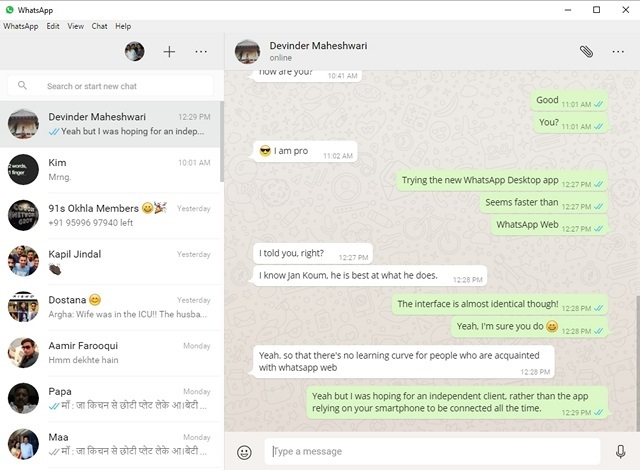 On the other hand, WhatsApp offers a web client as well as a desktop app and while they don’t run independently, they are pretty useful if you want to use the messenger from your computer. If you’ve tried Google Allo, you must have noticed that its UI is very similar to WhatsApp and that’s not a coincidence for sure. 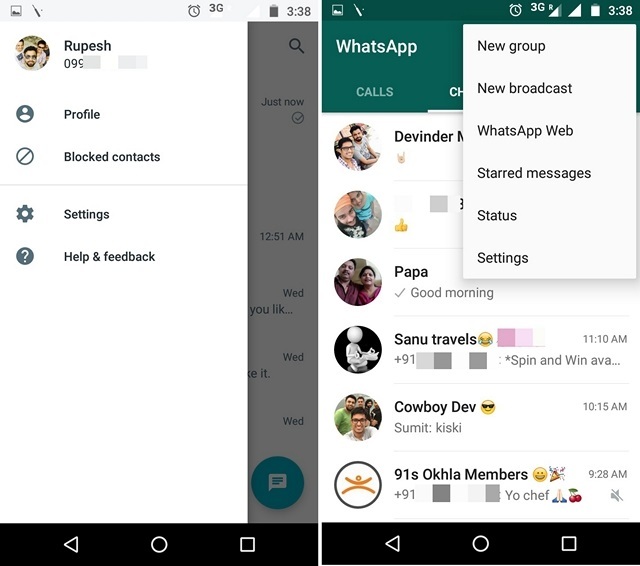 Google knows WhatsApp is the most popular messenger out there and the simple UI is what makes the app appeal to every section of users. There are minor differences though, as Allo incorporates Google’s much lauded Material Design a lot better, with the floating button and usage of colors. Also, it includes the hamburger menu, which opens up a navigation drawer, which in my opinion, is much easier to access, when compared to WhatsApp’s three-dot menu button on Android, especially on larger phones. Also, I like the fact that Google Assistant is integrated right into the app and there’s not a specific page or interface dedicated to it, which might have resulted in a cluttered experience. Overall, WhatsApp and Allo, both have a pretty similar UI, which is simple to use and straightforward. Having said that, the Allo interface does look more modern. Google Allo lacks a bit when it comes to the security, as it only incorporates end-to-end encryption in the incognito chat mode. Also, with Google Assistant integrated and bringing you answers and contextual results, it’s obvious Google is taking up data from your messages. While this will improve the Smart Reply and Assistant features, it isn’t the most secure process. To sum things up, WhatsApp is the more secure solution of the two, considering it’s only sharing user data like mobile number, contacts etc. and not the messages with Facebook. On the other hand, Google Allo lacks end-to-end encryption across the app and the Smart Reply & Assistant features will surely take up your message data to get better. SEE ALSO: Telegram Vs. WhatsApp: Which Messenger To Use? When it comes to messaging app, what makes or breaks them is the user base. We only use apps that our friends use and why would you use a messaging app that your friends aren’t using. 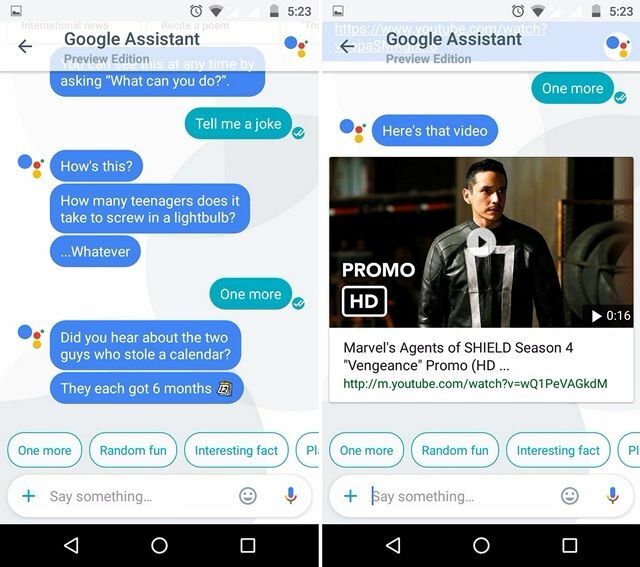 So, the point is, while Allo might be well equipped with killer features, it will be important to see if it’s compelling enough to make people use it for a long duration. If it manages that, then yes, we finally have an equivalent competition to WhatsApp. 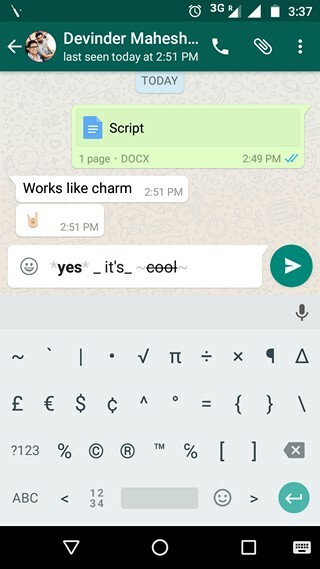 To sum things up, Google Allo certainly brings something unique, which is appreciable but it still lacks some features that people love on WhatsApp. However, if you ask me, none of the features it lacks is a major deal breaker, when you consider it’s just a messaging app. The bottom line is, you will love Google Allo but it all depends on if your friends love it or not. Well, that’s what I think, what about you? Tried Google Allo yet? According to you, how does it fare against WhatsApp? Sound off in the comments section below.